The historic Alphen Estate in Constantia, Cape Town is our location today. Set in this beautiful farmland between majestic mountains, vineyards and scenery is this funky home, which is vibrant and full of attitude. But, it didn’t look this way previously, it was bland and boring and had very minimalist and standard features that were replaced with edgy and eclectic home finishes. The vivid personality of the home owner has been incorporated into each corner of this house, and we simply love the style and character of the interior. 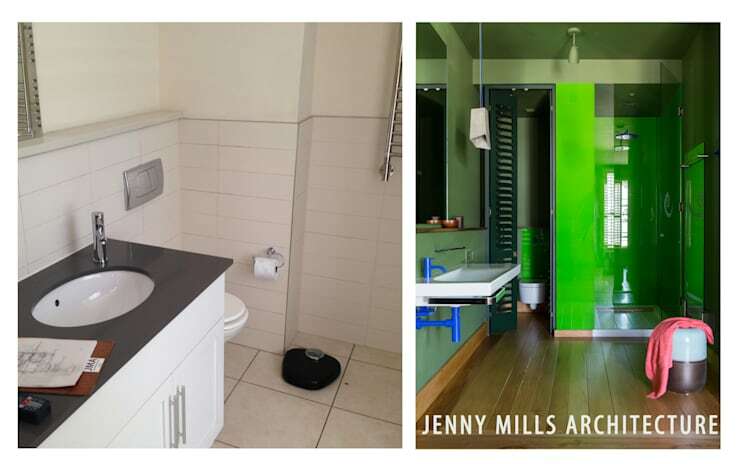 Although there was nothing physically wrong with the bathroom before, it just lacked a personal touch, which is why the home owner opted to add yellow wood flooring to warm the bathroom, while also choosing a vivacious colour for each bathroom in this home. This one is green and quirky, but absolutely spacious too! Just one of the fantastic end results by the team of architects. The kitchen was simple and minimalist before, with an internal wall separating the living space from the kitchen. But, the kitchen now has an open and elegant flowing feeling since the wall was removed. The colour scheme was completely changed too, it went from a basic all-white kitchen to a cosy and comfortable vintage inspired space. The living room is spacious and elegant and flows into the small garden, but the living room is so chic and stylish too, that it will make for a fantastic social zone. Just think about all the family and friends that can be welcomed into this cosy home to celebrate any occasion. This interior is comfortable and relaxing in every corner. Here are 40 Stylish and Spectacular Living Spaces. 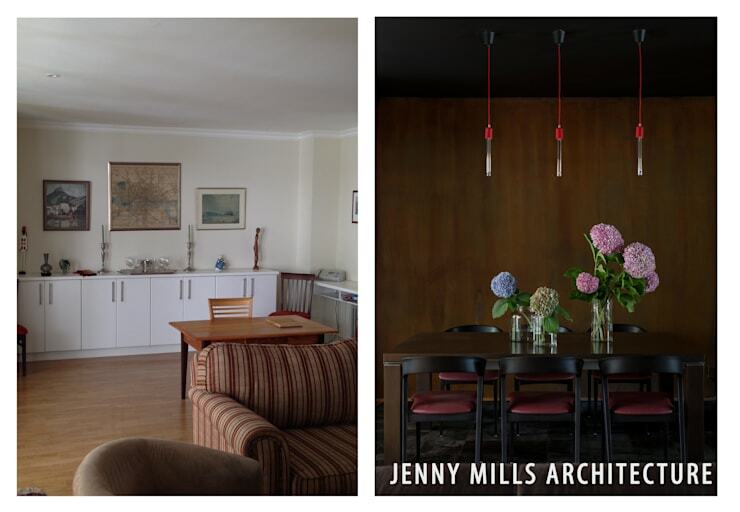 This dining room transformation is sensational. The space went from all-white décor to a warm and dramatic. Perfectly decorated in luxurious colours and romantic lighting, with vintage inspired walls creating a great dinner party environment. This dining room is a fantastic fit for this open plan living space. The staircase that leads up to the sleeping quarters of this home has been wonderfully remodelled as well. 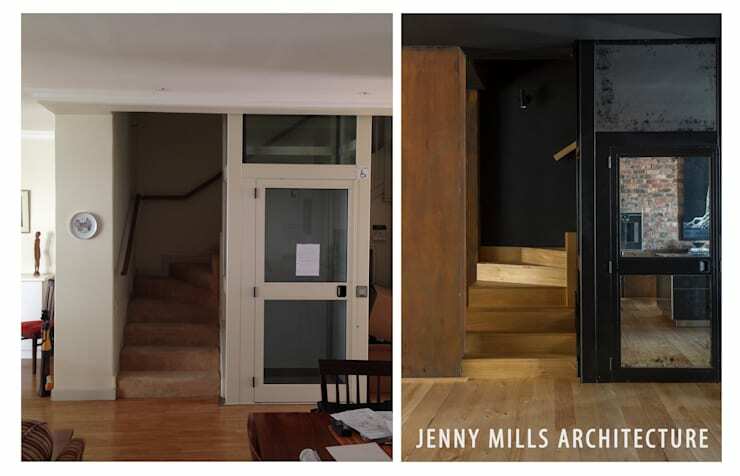 The stairs are now adorned in yellow wood, adding a warm and welcoming ambiance to the home, while the walls have been painted black for an eclectic yet modern look. The home has been decorated in four different types of wood, each creating its own effect on the interior, from the yellow wood for the floors and stairs, to the wenge wood sliding doors, as well as cedar flooring for the top floor of the home and American walnut wood used for the rest of the joinery, each adding to that rich yet solid and comforting atmosphere of this home. 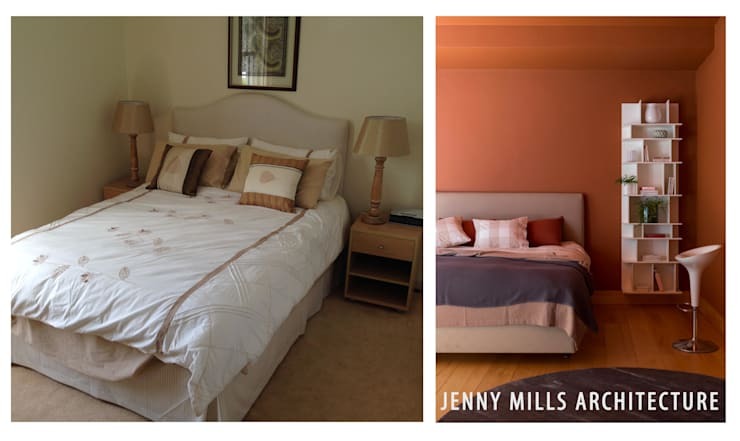 The old bedroom was given a complete and total stylish makeover, with earthy red walls brightening the ambiance and adding character and style to this plain Jane bedroom. Relaxing and unwinding in this tranquil space will now be easy and elegant. Vibrant colours in your home decor? What do you think?